Help end summer slide today – one child at a time, 12 books at a time. All it takes is $30 to provide one child with books to read all summer, along with a tote bag for carrying them. If you are donating as an individual, make sure to inquire with your employer about any eligible matching gift programs. 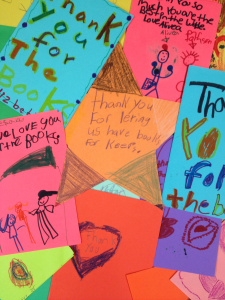 Some corporate matching programs will make a donation of up to 100 percent of any employee contributions, effectively doubling your gift to Books for Keeps! Donate as a business, as an individual, or band together with a group to keep a whole classroom, grade-level or even an entire school reading all summer long. For information on corporate sponsorship, including information about how Books for Keeps will recognize your company’s gift, please download our Sponsor Package. For additional questions about corporate sponsorship, contact Leslie Hale. Want to make a big difference in a simple, lasting way? Sponsor a school. A gift of $12,500 provides every single student in that school with 12 books and a tote bag to carry them home. Based on existing sponsorships, you can designate your gift to benefit a specific school. Download our Sponsor Package for information on how we will recognize your gift. Keep an entire grade up to speed and reading all summer long! Whether it’s kindergarten, fifth grade, or somewhere in between, you can designate your gift of $2,500 will allow you to adopt an entire grade-level at a school of your choice – based on existing sponsorships. Check out our Sponsor Package for information on how we will recognize your gift. 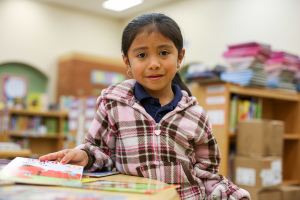 It takes just $600 to provide 12 books to every child in a classroom. Donate as a business, as an individual, or band together with a group to keep a whole classroom reading all summer long. If you are donating as a business, please refer to our Sponsor Package for detailed information on how we will recognize your gift. If members of your group are donating individually, instruct them to include a memo with the name of your group so we can tally donations. Then email your story and pictures to Leslie and we’ll post your story on our blog! No matter your ability, your contributions can make a difference in the life of a child. Just $30 will keep a child reading all summer long. Remember: You are somebody. You can do something. Check out a gallery and a list of our annual class, grade-level, and school sponsors at this link.